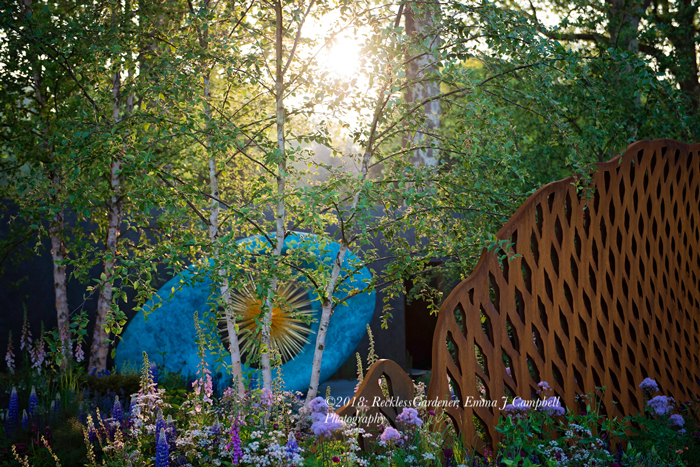 Sandy Felton reflects on a relaxed, chic and sunny RHS Chelsea and the diversity of the large show gardens. The sun certainly put its hat on for press day as we arrived for the preview of the 2018 RHS Chelsea Flower Show – and what a Show! 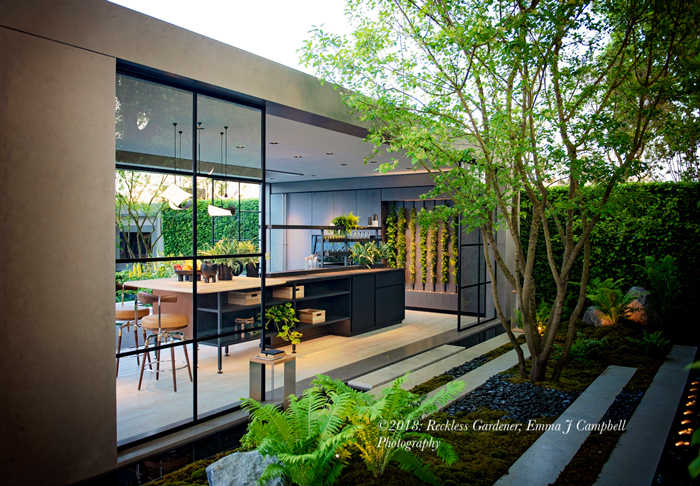 The diversity of the gardens, the new Space to Grow category and an increasingly important emphasis on health and well-being perfectly come together to highlight the many benefits of horticulture in our lives. 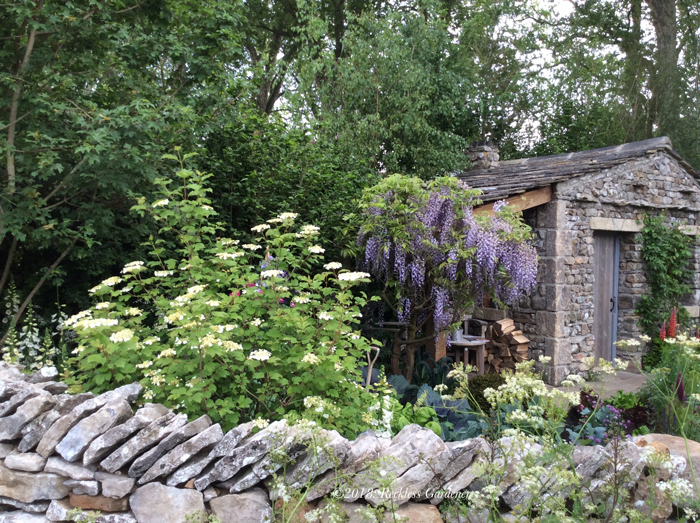 The show gardens are very diverse taking us on a tour of the world as well as parts of our own country – so from Yorkshire to Iraq and from Japan to Cornwall, there is certainly something for everyone to enjoy and be inspired by. The new Space to Grow category is sure to prove popular, aiming to inspire visitors to make the most of their urban plots. The Artisan gardens are once again small but perfectly formed and the colour, energy and range of exhibits in the Great Pavilion are simply breathtaking. 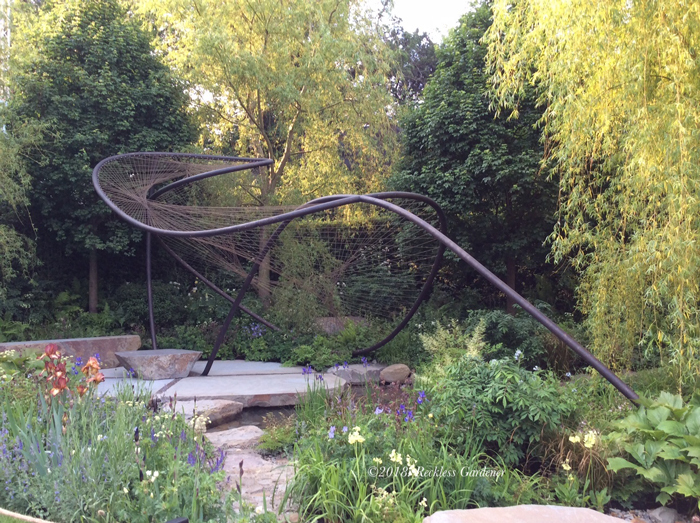 Trending this year is the importance of sculpture in the garden and the use of metalwork in adding instant impact. 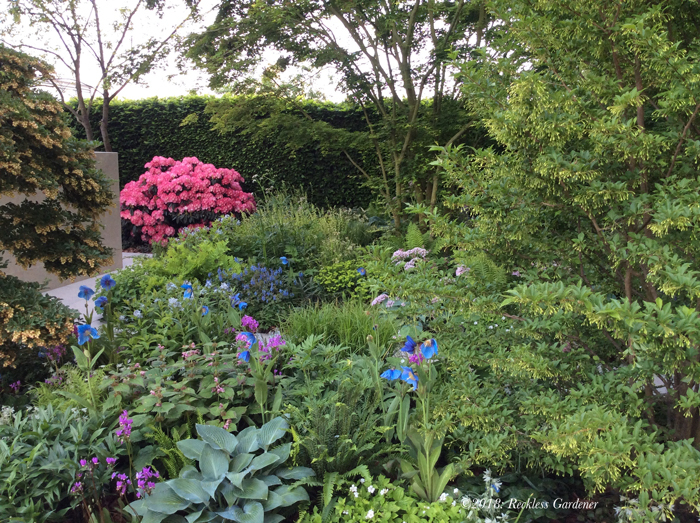 Cottage garden plants are much to the fore and there is a heady mix of exotics but the lupin seems to triumph overall this year followed closely by some pretty cool hostas and Rhododendron, particularly on Chris Beardshaw’s garden. 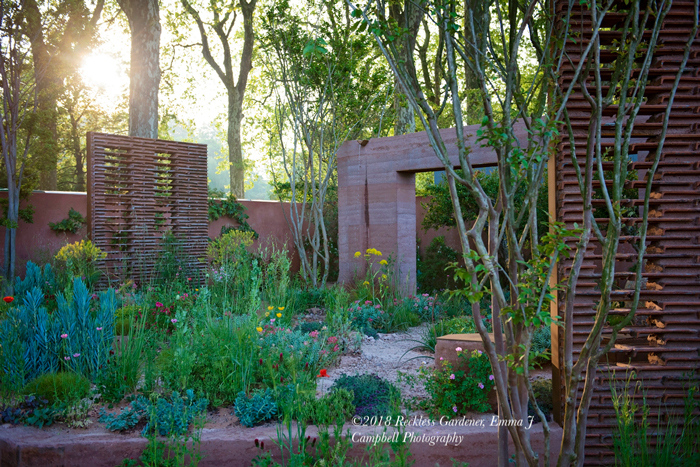 Delighted for Chris Beardshaw, whose Morgan Stanley Garden for the NSPCC won Best in Show and Gold. The garden takes us through a sheltered and densely planted woodland space, filled with a variety of shrubs, including Enkianthus, Styrax and Rhododendron, shaded by a canopy of large specimen trees. 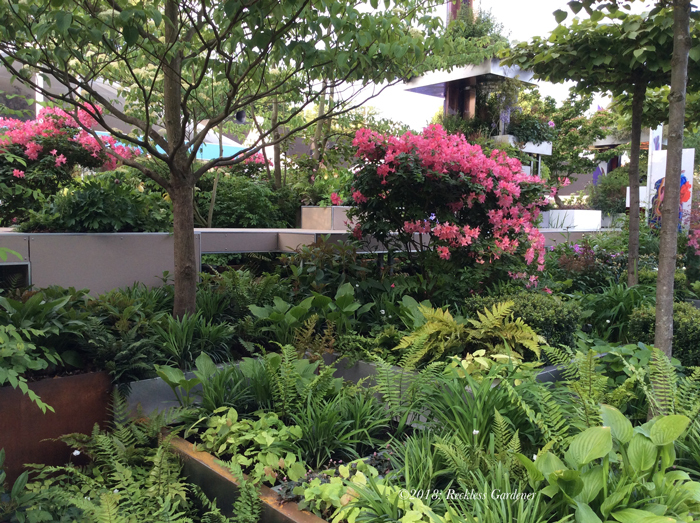 These include an Amelanchier lamarckii, a magnificent Acer Palmatum and a Betula nigra, which at almost 12 metres high, is thought to be one of the largest trees ever used in an RHS Chelsea Show Garden. Chris can always be relied upon to bring us a wonderful array of plants and there was plenty here to whet the appetite from Hosta ‘Halcyon and ‘Devon Green’ to Meconopsis, the wonderful Primula ‘Apple Blossom’ and Euphorbia amygdaloides ‘Purpurea’. Simply superb with the restful pavilion area forming the coup de grâce of the whole garden. Just for once, totally in accord with the judges decision to award this garden Best in Show. The competition for Best in Show is always tough but this year I think the stakes were even higher than normal. The serene and beautiful Wedgwood Garden, (above) designed by Jo Thompson, (Gold) was a delight with delicate planting and a wonderful pavilion structure designed in collaboration with the Department of Engineering at the University of Cambridge. This garden has everything, there is a meandering stream, naturalistic rocks softened by delightful planting and this wonderful and unusual structure that seems to change form as you move around it. Elegant and beautifully designed, a total triumph for Jo and her team. 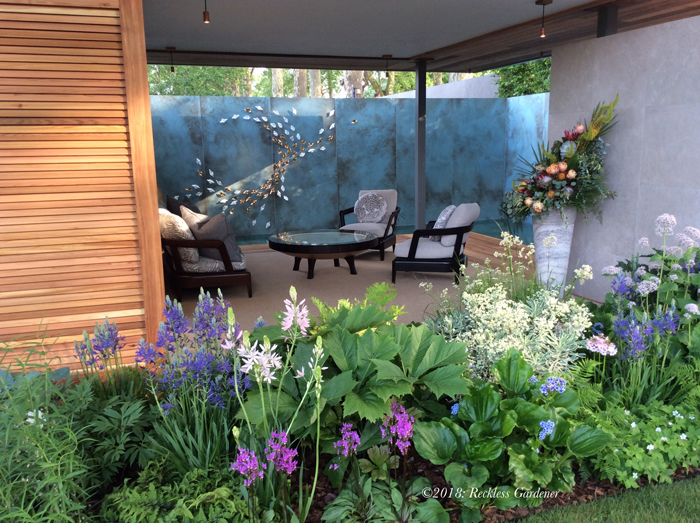 The M&G Garden (above )designed by Sarah Price (Gold) is a dreamy romanticised haven, perfectly encapsulating the language of colour and texture, light and shadow. It takes its inspiration from the Mediterranean so there are plenty of drought tolerant plants to look out for on this one with taller, wispy flowers blending to make a beautiful tapestry of colour and form. Certainly another space you would be happy to linger in and again a highly crafted and clever design. 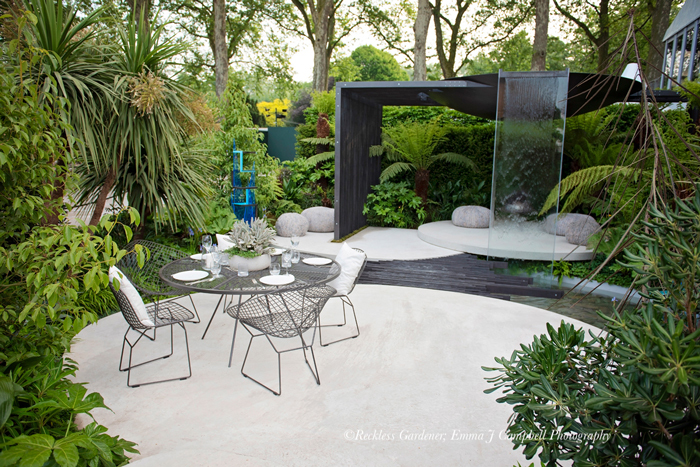 The Welcome to Yorkshire Garden (above) designed by Mark Gregory (Gold) was clearly another contender for Best in Show and certainly created a talking point with everyone on press day. This garden is so meticulous there is even sheep droppings! The dry limestone walls are a triumph and the whole design is a wonderful tribute to the natural materials, food production and traditional crafts of Yorkshire. Just loved it and a great tribute to designer Mark Gregory’s 30 year anniversary in horticulture. Very likely a contender for People’s Choice this one. Absolutely drooled over and loved the Trailfinders South African Wine Estate Garden (pictured banner top of page) designed by newcomer Jonathan Snow (Silver-Gilt). I had long anticipated seeing this garden completed and I wasn’t disappointed. 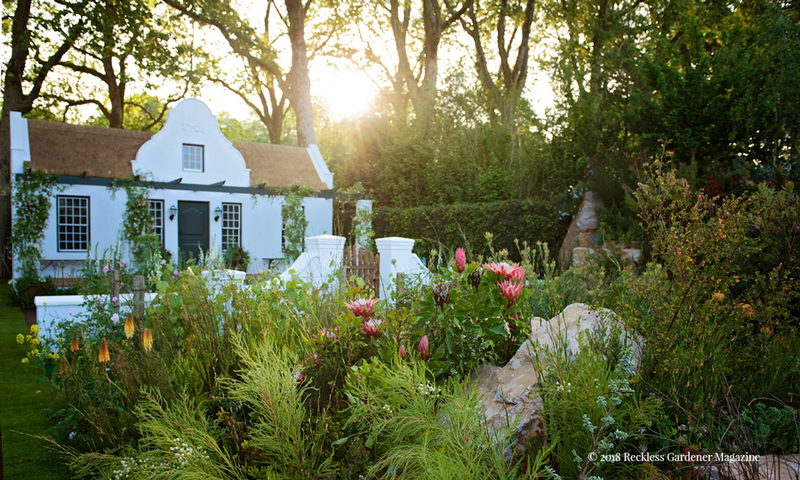 A triumph with its wonderful fynbos planting, its traditional Cape Dutch homestead and its juxtaposition of exotic-looking flowers contrasting with the manicured, domestic garden – eat your heart out for the agapanthus, knipfolias and pelargoniums. Hopefully, we will see more of this designer’s work in the future at Chelsea. 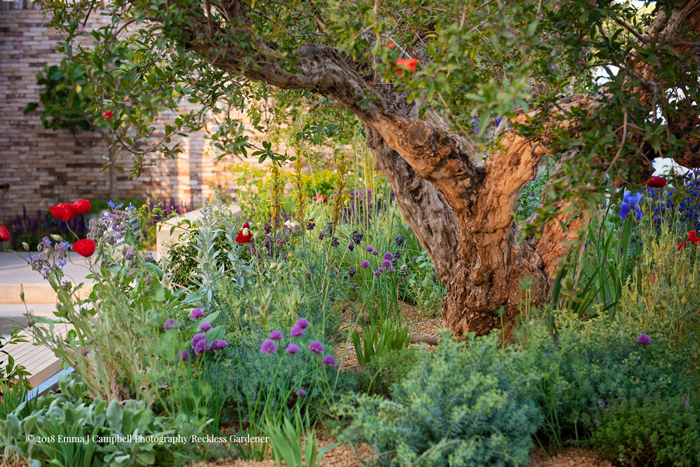 The large show gardens this year will certainly reach out to their audiences and in so doing present a mellow and calming influence on this year’s Chelsea. They are diverse, interesting and entertaining but they also demonstrate why our gardens and horticulture are so important to the soul. A vintage Chelsea! All photographs are strictly © Reckless Gardener and Emma J Campbell Photography.